Burlington has long held a reputation as an arts destination. Its numerous venues, well-attended festivals and thriving performing-arts scene have landed it on AmericanStyle Magazine’s list of the Top 25 Small Cities for Art several years in a row. The city has even ranked as the sixth most artist-friendly alternative to New York City and Los Angeles, based on the cost of living, local flavor and value placed on the arts. Happily, the arts extend far beyond Burlington and into the rest of the Green Mountain State. That fact is underscored every spring and fall, when the Vermont Crafts Council organizes an Open Studio Weekend, designed to showcase the visual arts and illuminate the creative process. Bright yellow signs along roadsides guide visitors to 250 artist studios across the state. You'll find everything from handcrafted rocking chairs in Starksboro to glassblowing in Johnson. In advance of the Open Studio Weekend on May 23 and 24, we're highlighting three artist studios well worth the drive from Burlington, as well as attractions to explore along the way. When Tropical Storm Irene ravaged Waterbury in 2011, water flooded the first floor of Jeremy Ayers' home up to the windows. The artist's pottery studio, in the basement, was completely wiped out. Visitors to the large yellow house, in Ayers' family for six generations, won't be able to spot the damage today. The space is warm and dry and smells pleasantly of wet clay. 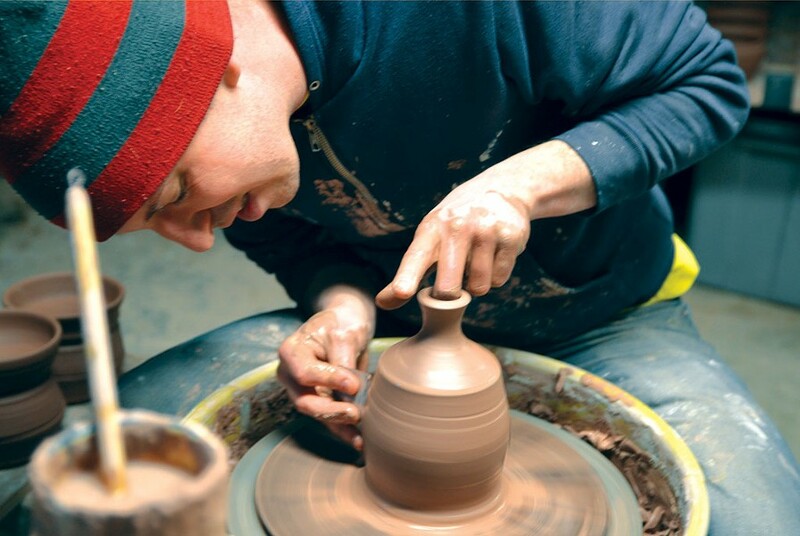 In fact, the storm directly led to Ayers devoting himself to his pottery business full time. He left a teaching job to rebuild his home and care for his ailing grandfather — who, as a 10-year-old, had been rescued by rowboat during Waterbury's flood of 1927. When Ayers finished the home's renovations in late 2012, he decided to turn his craft of more than 15 years into his main gig. Ayers' utilitarian stoneware — jars, mugs, vases, teapots, platters and serving bowls intended for daily use — seamlessly melds form and function. The pieces feature bold, striped patterns in a limited, natural color palette: white on brown, white on black, even white on white. "I'm not really into the rainbow-y, runny glazes," explains Ayers. "I'm working with the absence of color. I want it to be about line and form." Ayers went to art school with the intention of becoming a photojournalist. Once there, however, he became captivated by the potter's wheel. "The 18-year-old me fell in love with the romance" of this old-fashioned art form, he recalls. That passion continues today. "My favorite piece," Ayers says, "is usually the one that I'm making." Cold Hollow Cider Mill: Located along a popular tourist route nicknamed “Enticement Alley,” this old-fashioned general store on Route 100 presses cider year-round and fries cider doughnuts that have been featured in Gourmet magazine. Green Mountain Club Visitor Center: This nonprofit club maintains the Long Trail, which spans the length of Vermont and is America’s oldest long-distance hiking trail. Learn all about the Green Mountains here, then picnic amid stunning views of the ranges and walk the half-mile Short Trail. Ben & Jerry’s Factory: Short and sweet, the 30-minute tours of this ice cream mecca — Vermont’s version of Wonka’s Chocolate Factory — include a short “moo-vie,” a taste test and stops at the Flavor Graveyard and scoop shop. 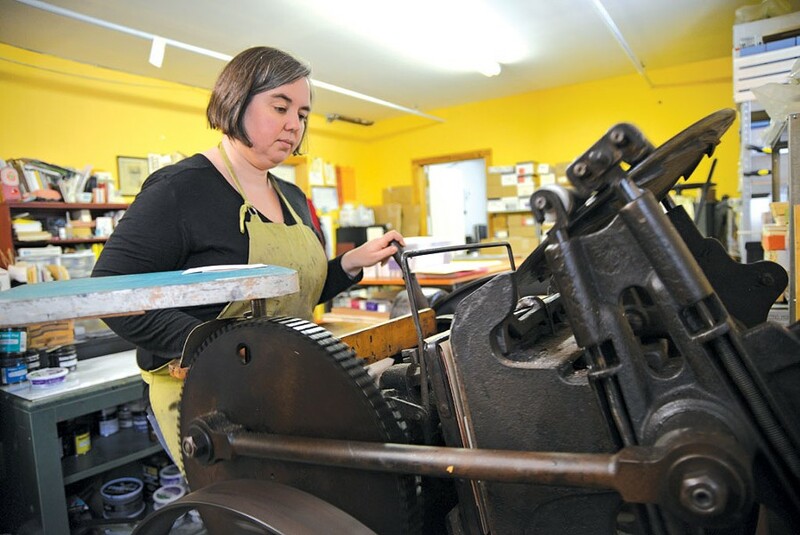 Elegant letterpress printing has become the new standard for wedding invitations, but Kelly McMahon's cheery yellow studio will remind you that this craft is more than a passing trend. Sitting among four other presses is a prewar, cast-iron Chandler & Price contraption. With ornate, twisted spokes and a foot treadle, the machine is so dated that it now looks steampunk cool. Indeed, until the 1980s, letterpress was the normal method of printing text since its 1440s invention by Johannes Gutenberg. "There used to be letterpress printers in every town," explains McMahon. "Now they're few and far between." McMahon describes herself as a "one-time poet and type junkie who learned the tools of the trade and never looked back." While getting her MFA in creative writing, she took a seminar on artists' books. "I set some type and I was hooked," she says. "It's a practice in perfection. It's really soul-satisfying to be really good at this one small thing." Her May Day Studio space, shared with a band and a painter, produces quirky, handcrafted paper goods — including a line of brightly colored, original designs sold on Etsy, from love notes to market totes. "I came into all of this pretty ignorant of the history of printmaking," McMahon recalls. Now, she says, "It really feels sort of like a duty to learn as much as I can about the way [printing] was done" — and to share it. She'll do just that at Open Studio Weekend, when visitors will be able to run one of her original prints through the press. Capital City Farmers Market: This bustling, year-round Saturday market moves outdoors starting in May. Listen to live music and watch cooking demonstrations while strolling the stalls and sampling local cheese, jam, honey and syrup. North Branch Nature Center: Bird-watch, walk, ski or swim at this 28-acre preserve located at the bend in the north branch of the Winooski River. Trails follow the river and connect to scenic Hubbard Park, which has a 54-foot stone observation tower and picnic pavilion. NECI on Main: Functioning as both a full-service restaurant and a New England Culinary Institute classroom, students — tomorrow’s great chefs — prepare seasonal, locally sourced brunches, lunches and dinners. In her studio — an old gristmill where grain occasionally still falls from the ceiling — Anne Cady paints a treasured view of Vermont over and over again. It's the Middlebury horse farm where she spent her childhood summers. "The rural countryside gave me so much happiness and enabled me to breathe," she recalls. "I'd come to Vermont in the summer and just go, Ahhh." 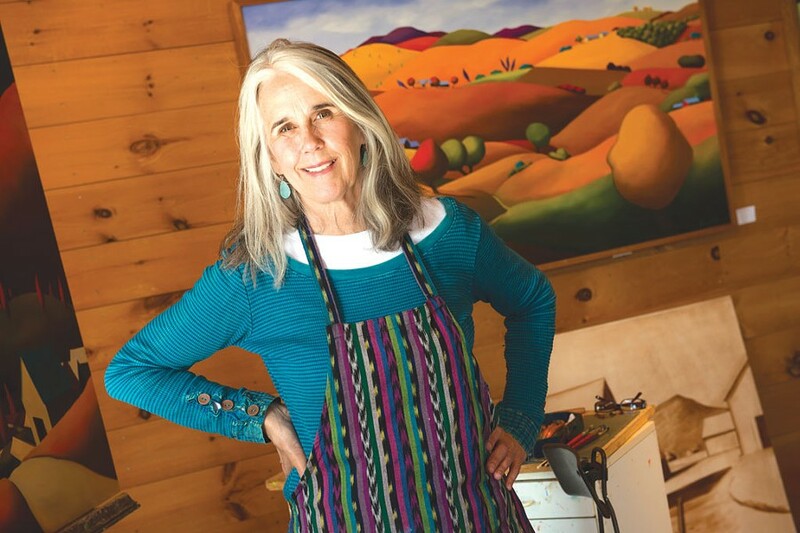 That view "is with me while I'm painting, and it comes through my paintings in so many ways," she says — though her canvases never look the same. Cady's work clearly conjures Vermont's rolling hills, looming mountains, old barns and cultivated farmland. But she uses jewel tones and fantastical perspectives that don't exist in nature. The trees look like cotton candy, and the ground seems to glow from within. Cady is adamant about not playing by the "rules" when it comes to art. On her website, she explains her outlook with a quote from Paul Gauguin: "Do not copy nature too closely. Art is an abstraction; derive it from nature while dreaming in front of it." That's a lesson she's passed on to generations of art students. "When you're a kid, everybody can draw and paint things," she says. "Then, as you grow, some outside force tells you you can't do things." To counter that force, she began giving backyard classes to neighborhood kids at age 15. After settling in Vermont, she founded and ran an art school for 30 years. Now, with grandchildren of her own, Cady is still experimenting with creative expression. "I'm playing with composition and color all the time," she says. "There's a rhythm, there's a softness ... there's a magic. It's more like a dream." The Bobcat Café & Brewery: Since 2002, this favorite locals' haunt has served contemporary, farm-fresh comfort food alongside in-demand, house-brewed beers. Lu•Lu Ice Cream: Opening for the season in May, this small-batch, artisan ice cream shop scoops flavors like the Walking Dead — vanilla ice cream with marshmallow "brains," a ripple of fresh raspberry "blood" and dark-chocolate chunks. Bartlett Falls: Located right off Lincoln Road about two miles east of downtown Bristol, this popular swimming spot has a 15-foot waterfall, natural waterslides and deep-green pools — some deep enough for responsible diving. Burlington a depuis longtemps la réputation d’être une destination artistique. Ses nombreuses salles, ses festivals très prisés et sa scène culturelle florissante lui ont valu de faire partie du palmarès « Small Cities for Art » du magazine AmericanStyle plusieurs années de suite. Elle s’est même classée sixième parmi les villes qui peuvent remplacer New York et Los Angeles pour leur sympathie pour les artistes, compte tenu du coût de la vie, de la couleurr locale et de la place accordée aux arts. Heureusement, cette effervescence ne se limite pas à Burlington : elle rayonne partout dans l’État des Montagnes vertes. On le constate chaque année, au printemps et à l’automne, quand le Vermont Crafts Council organise son week-end Open Studio (vermontcrafts.com) afin de mettre en valeur les arts visuels et le processus de création. À cette occasion, des panneaux jaune vif en bord de route guident les visiteurs vers 250 ateliers d’artiste partout au Vermont. Vous y trouverez de tout, des chaises berçantes faites à la main à Starksboro aux œuvres en verre soufflé à Johnson. En prévision de ce week-end haut en couleur, qui se tiendra les 23 et 24 mai, nous vous présentons trois ateliers d’artiste à l’extérieur de Burlington qui valent le détour ainsi que divers attraits touristiques à explorer durant le trajet. Quand la tempête tropicale Irène a ravagé Waterbury en 2011, les eaux ont inondé le premier étage de la maison de Jeremy Ayers jusqu'à la hauteur des fenêtres. Son atelier de poterie, dans le sous-sol, a été complètement dévasté. Aujourd'hui, si vous visitez cette grande maison jaune, qui appartient à la famille Ayers depuis six générations, vous ne verrez aucune trace de dommages. L'espace, chaleureux, sent bon l'argile humide. En fait, depuis la tempête, Jeremy a décidé de se consacrer à temps plein à son entreprise de poterie. Il a quitté son poste d'enseignant pour rebâtir sa maison et prendre soin de son grand-père malade; celui-ci, à l'âge de 10 ans, a été rescapé à bord d'un canot à rames lors des inondations de Waterbury en 1927. Quand Jeremy a achevé les rénovations à la fin de 2012, il a décidé de transformer en gagne-pain son passe-temps des 15 dernières années. Cold Hollow Cider Mill: Situé le long de la route 100, une artère touristique très courue surnommée « Enticement Alley », ce magasin général à l’ancienne fabrique du cidre toute l’année et des beignets frits au cidre dont le magazine Gourmet a déjà vanté les mérites. Green Mountain Club Visitor Center: Ce club sans but lucratif veille à l’entretien de la Long Trail, qui traverse tout le Vermont et qui constitue le sentier de longue randonnée le plus ancien d’Amérique. Vous y apprendrez tout ce qu’il y a à savoir sur les Montagnes vertes, et vous pourrez y pique-niquer en profitant d’un panorama époustouflant. Ne manquez pas non plus d’emprunter la Short Trail, qui s’étend sur moins d’un kilomètre. Ben & Jerry’s Factory: Les visites d’une demi-heure de cette « destination crème glacée » par excellence (pensez à Charlie et la chocolaterie, façon Vermont) comprennent le visionnement d’un court métrage, une séance de dégustation et un arrêt au bar laitier Flavor Graveyard. La typographie élégante qui orne les invitations de mariage est peut-être à la mode, mais une visite au bel atelier jaune vif de Kelly McMahon vous convaincra que cet art n'est pas qu'une simple tendance passagère. Parmi les quatre autres presses typographiques, on trouve une machine Chandler & Price en fonte qui date de l'avant-guerre. Avec ses fioritures et son fonctionnement à pédale, elle est si ancienne qu'elle en devient cool! Dans son atelier, May Day Studio, qu'elle partage avec un groupe de musiciens et un peintre, Kelly fabrique à la main des articles de papier uniques, dont une gamme de créations originales aux couleurs éclatantes – allant des lettres d'amour aux sacs d'emplettes – qu'elle vend sur Etsy. « J'ai commencé à pratiquer le métier sans trop connaître l'histoire de l'imprimerie, dit Kelly, mais maintenant, je me fais un devoir d'en apprendre le plus possible sur le sujet et de partager mes connaissances. » Et c'est ce qu'elle fera durant le week-end Open Studio, quand les visiteurs auront l'occasion de passer l'une de ses créations originales dans la presse typographique. North Branch Nature Center: Observation d'oiseaux, randonnée, ski ou natation : voilà autant d'activités que vous pouvez pratiquer sur cette réserve de 11 hectares située au détour de la branche nord de la rivière Winooski. Les sentiers longent la rivière et débouchent sur le pittoresque parc Hubbard, où l'on trouve un tour d'observation en pierre de 16 m et un pavillon de pique-nique. NECI on Main: Dans cet établissement, qui abrite à la fois un restaurant à service complet et une salle de classe de l'Institut culinaire de la Nouvelle-Angleterre, les chefs cuisiniers en herbe préparent des mets saisonniers savoureux, à partir de produits locaux, pour le brunch, le dîner et le souper. Dans son atelier, un ancien moulin dont le plafond laisse encore parfois tomber des grains, Anne Cady peint inlassablement le même paysage, un coin du Vermont qui lui tient à cœur puisqu'il s'agit de l'élevage de chevaux Middlebury où elle passait ses étés quand elle était petite. « La campagne m'a procuré beaucoup de bonheur, dit-elle. L'été au Vermont, pour moi, c'était la possibilité de prendre un bol d'air. « Ce paysage me revient toujours en tête quand je peins, et cela se traduit de bien des manières dans mes œuvres. » Bien qu'aucune de ses toiles ne soit pareille à une autre, Anne évoque toujours les collines ondulantes, les montagnes majestueuses, les vieilles granges et les terres agricoles du Vermont. Par contre, elle utilise des tons de joyaux et des perspectives fantastiques qui n'existent pas dans la nature. Par exemple, le feuillage des arbres ressemble à de la barbe à papa et une lueur semble émaner du sol. Voilà une leçon qu'Anne s'applique à transmettre à ses étudiants. « Quand on est enfant, dit-elle, on peut dessiner et peindre n'importe quoi. Mais, en grandissant, une force externe nous dit qu'on ne peut pas faire telle ou telle chose. » Pour contrer cette force, Anne donnait des cours à des jeunes de 15 ans du voisinage. Après s'être établie au Vermont, elle a fondé et exploité une école des beaux-arts pendant 30 ans. The Bobcat: Depuis 2002, cet établissement très prisé par les gens du coin sert une cuisine réconfortante, composée d’ingrédients frais, ainsi que des bières brassées sur place. Lu•Lu Ice Cream: Ouvert dès le mois de mai, ce comptoir de crème glacée artisanal offre des saveurs inusitées comme « Walking Dead » : une crème glacée à la vanille avec des « cervelles » en guimauve, un jet de « sang » aux framboises fraîches et des morceaux de chocolat noir. Bartlett Falls: Situé tout juste en retrait de Lincoln Road, à environ trois kilomètres à l’est de Bristol, ce site de baignade populaire offre une cascade de près de cinq mètres, des glissades d’eau naturelles et de profonds bassins, dont certains se prêtent bien à la plongée responsable. The original print version of this article was headlined "Points of ViewThree artsy road trips within an hour of Burlington"